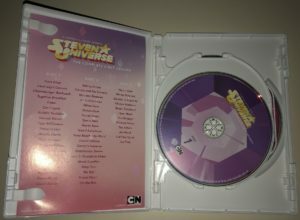 “Steven Universe: The Complete First Season” is the highly anticipated first major U.S. DVD release for Steven Universe. This three-disc collection features every episode of Season 1 of the show (alongside a couple of episodes usually placed in Season 2) in a beautiful presentation with some additional cool special features on the third disc. It’s a really well put-together collection, despite the lack of a Blu-ray version or commentary tracks (to be clear: there are none) like Cartoon Network was initially advertising. You probably aren’t buying this DVD to re-watch or to show Season 1 to friends with, since it isn’t in HD. Having no Blu-ray option available is a little baffling, but somewhat par for the course with a lot of animated shows unfortunately. The episodes still play beautifully though; they look great and have great sound. There are subtitles available for every episode. 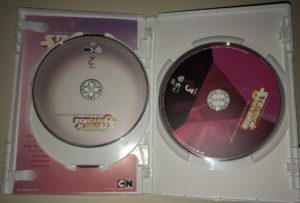 The presentation of the DVD is a major highlight, following up on the style Cartoon Network has previously used for its DVD releases of Adventure Time. The outside box features what seems like a weird choice of Steven’s face, but when stacked on top of the front of the inside box, which depicts Steven holding up his shirt to reveal his gem, the pair create a two-part image. 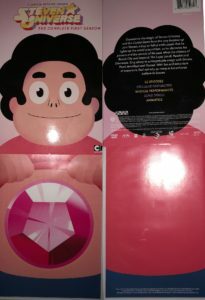 Same with the back of the box: the outside back is the back of Steven’s head, and the inside back is the back of his shirt. This presentation is very cool and I love the image of his gem in particular. The discs themselves are also very pretty and the inside card lists all the episodes with another image of the Rose Quartz gem on the back of it. The menus are minimalistic but beautiful. The main menu is particularly great, featuring an image of the statue hand from the credits with the instrumental version of “Love Like You” playing. The other menus are also nice looking and have tracks from show’s score. Let’s get to what will be the biggest thing for many: special features. Once you can get past the lack of commentaries, I do think that overall the features are good. There are five total: I love two of them, found two others to be good, and one was a dud. “Behind the Music” is a telling of how music is used in Steven Universe mainly framed through an interview with Rebecca Sugar. It also features an interview with composers Aivi Tran & Steven “Surasshu” Velema, as well as clips from the show, San Diego Comic-Con 2017, and performances found elsewhere on the DVD. There’s nothing revelatory here but it’s a really well put-together video. “Listening Party” features footage of the Listening Party event from May 2017 with Dan Casey interviewing Rebecca Sugar, them going through songs from the show, and Rebecca performing at the end. This is a condensed version of the event, and fan footage was already online, but it’s very well shot and edited together. “Music Video Performances” is a weird name for the best feature on the DVD. It features Rebecca Sugar (sometimes solo, sometimes with Aivi & Surasshu) performing five songs from the show: “Something Entirely New”, “It’s Over, Isn’t It”, “Love Like You”, “Here Comes a Thought”, and “What’s the Use of Feeling (Blue)?”. I really love these; it’s awesome to see Rebecca performing these songs outside of the demos we’ve heard. “Animatics” consists of five full episode animatics (the storyboards in motion + audio) for “Gem Glow”, “Full Disclosure”, “Steven the Sword Fighter”, “Steven and the Stevens”, and “Island Adventure”. It’s very cool to see animatics for these entire episodes and I think this was a really worthwhile feature to include. “Song Demos” features audio of Rebecca Sugar performing the demos for “Be Wherever You Are” and “Full Disclosure”. That’s it… we already had these online and having them here didn’t really add anything. It’s hard to call this DVD anything close to a must-buy without a Blu-ray option or commentary tracks, but it’s still a really solid product that’s great to look at. It’s a good addition to any SU fan’s collection and hopefully the first of many Steven Universe DVDs to come. 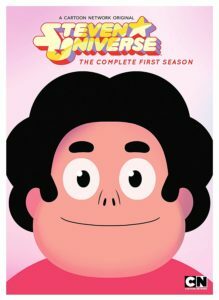 “Steven Universe: The Complete First Season” is out January 30th.